ალბერტ ფინი (ინგლ. Albert Finney; დ. 9 მაისი, 1936 — გ. 7 თებერვალი, 2019) — ინგლისელი მსახიობი. თავდაპირველად მოღვაწეობდა თეატრში, ასრულებდა როლებს შექსპირის პიესებში. 60-იან წლებში დაიწყო კინოკარიერა. მიღებული აქვს ოსკარის ოთხი ნომინაცია. გარდაიცვალა 2019 წლის 7 თებერვალს ლონდონში, 82 წლის ასაკში. 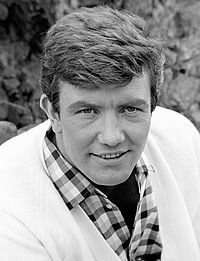 ↑ “Actor Albert Finney dies aged 82“, BBC, 8 February 2019. ↑ Guy, Jack. “Albert Finney, five-time Oscar nominee, dead at 82“, CNN, 9 February 2019. ↑ “Albert Finney, 'Angry Young Man' Who Became a Hollywood Star, Dies at 82“. ეს გვერდი ბოლოს დარედაქტირდა: 13:10, 12 თებერვალი 2019.